HP has released its fiscal Q1 earnings with unexpected growth in its PC business. HP's CEO Meg Whitman said recently that this was the first time in seven quarters the company's PC business has experienced growth. 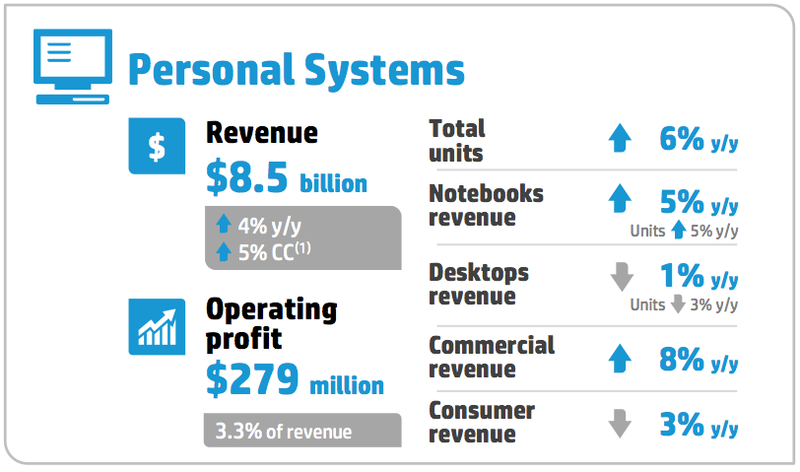 The company's Personal Systems Group (PSG) saw revenue of $8.5 billion, a 4% growth compared to the year prior. Much of the growth here looks to be from non-consumer, commercial notebook sales which grew 8% year-over-year, contributing to a 5% hike in overall notebook revenue. Consumer sales, on the other hand, dipped 3% compared to a year ago, along with a 1% drop in desktop revenue. Whitman remains positive that people will still want to replace their older PCs with new ones as opposed to moving entirely over to a tablet. "While employees may want a tablet, they also need more traditional compute devices to do their real work," the CEO said. Some have suggested the growth could be due to a large number of business Windows XP systems being retired and replaced. When asked about future projections for PSG and whether or not she sees further growth across the year, Whitman said "Hard to call. My experience over many years of business is that you always underestimate on the way down about how bad it's going to be and on the way up sometimes it's better than you think it's going be."